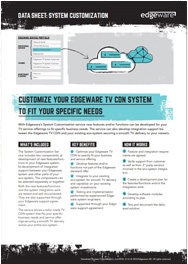 With Edgeware’s System Customization service new features and/or functions can be developed for your TV service offerings to fit specific business needs. The service can also develop integration support between the Edgeware TV CDN and your existing eco-system securing a smooth TV delivery to your viewers. b) development of integration support between your Edgeware system and other parts of your eco-system. The components can be selected separately or together.